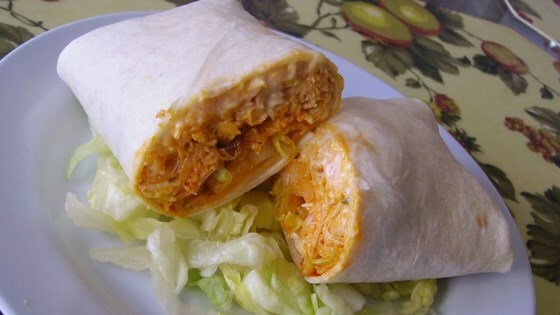 "Boneless skinless chicken breasts, cut into bite size pieces, cooked and covered in Buffalo sauce, combined with crisp bacon, diced tomato, and ranch dressing, are wrapped in heated flour tortillas. You can increase or decrease the amount of Buffalo sauce to your taste and also add shredded Cheddar cheese to your wraps if desired." Place the bacon in a large, deep skillet, and cook over medium-high heat, turning occasionally, until evenly browned and crisp, 10 to 15 minutes. Drain the bacon slices on a paper towel-lined plate. Crumble when cool. Drain off all but 2 tablespoons of the bacon drippings, and cook and stir the chicken breast chunks until browned, about 10 minutes. Cover the skillet and allow chicken to continue cooking until no longer pink inside and the juices run clear, about 10 more minutes. Stir in the Buffalo sauce and melted butter until chicken is thoroughly coated. Stir in the crumbled bacon. Keep the mixture warm. Heat the tortillas, one at a time, in a large ungreased skillet over medium heat until they begin to form air bubbles and small brown spots. Fill each each warmed tortilla with about 1/3 cup of the chicken filling and a tablespoon or so of tomatoes; sprinkle the tomatoes with 1 tablespoon of ranch dressing. Wrap the tortilla around the filling; serve warm. Bland, bacon overpowering and crunchy not a family favorite. Very tasty, even my 8-year-old loved it. I added lettuce to bump up the veggies a little, but otherwise made it just like the recipe. I decided to make tacos with this recipe so I added lettuce and cheddar cheese. It was delicious!